[Image: Mike Bouchet's Watershed being towed through Venice towards the Arsenale basin, against a backdrop of Italian palazzi]. 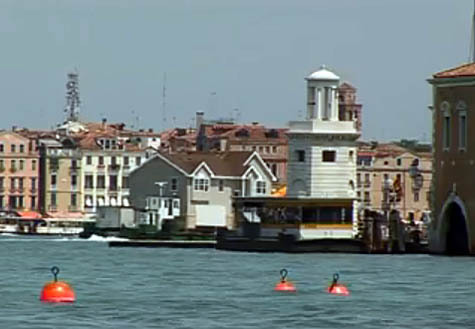 David Birnbaum, the Biennale's curator, told camera crews filming the installation that he thought the project "sounded a bit megalomaniac," but the sight of the oversized house, clad in beige vinyl, flimsily bobbing up and down against a backdrop of palazzi and piazzi as it was towed through Venice's canals, was breathtaking. It was an architectural icon of the American Dream revealed in all its formulaic absurdity. Amazingly, then, one of the pontoons capsized, and the entire house sank to the bottom of the canal—an unintentional yet utterly perfect coda to the house's own built-in commentary. 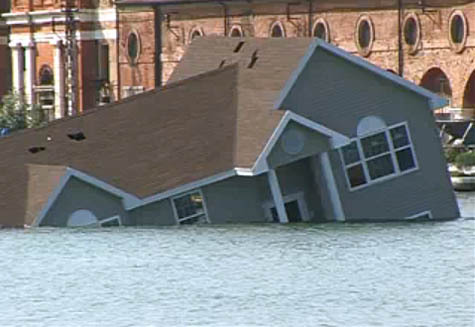 Now, a fake generic American suburban home will add its ruins to the underwater archaeology of Venice. [Image: Mike Bouchet's Watershed goes down]. A two-minute video of the house's journey, and eventual fate, can be seen in full on YouTube. Sadly not as dramatic as it appears - it looks like the canal wasn't deep enough to cover the house, so it'll no doubt get removed fairly quickly. Another terribly wasteful use of money by an artist for "arts" sake - as he laughs at the end of the video. Must be nice to have so much money one can laugh as it sinks. Our sense of satire and urge to critique seems to have transformed from Aldo Rossi's floating theatre with its poetics (which was used for the Venice Biennale in 1979 as a recall of the floating theatres which were so characteristic of Venice in the 18th century) to American suburban houses...or maybe its just the recession. i can appreciate differentiation and originality. i like fresh and new ideas. sorry - this just does nothing for me.